Locked up their best players for the next x-years. Improved the offense without breaking the bank/trading away their best players/taking on another stupid contract. Left themselves with some flexibility to make in-season moves (a strategy that has actually helped the team the last three years: see Penny, Sanchez, Burrell, Ross, Lopez, Beltran). which is as good as Manny Burriss has ever looked with the bat. I wrote last week that the thing the Giants needed to do was fortify themselves at shortstop. I love Brandon Crawford and I want him to do well so badly, but that desire does not erase the fact that he’s not ready to be an everyday major league shortstop. I’m going to root for me to be so wrong, but I also would love to see some help at this position. The Giants seem to think Burriss is this help. Which is like the Patriots thinking they’ll be fine with Jed Hoyer if Tom Brady goes down. Nope. That’s foolish. 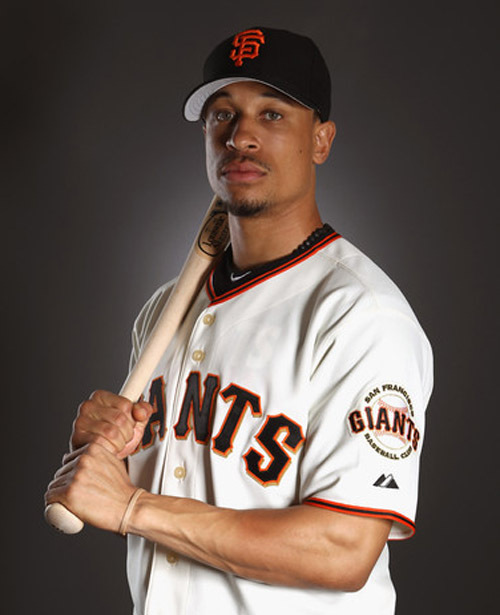 It’s foolish to think Manny Burriss is going to be helpful to the Giants. This is a disaster waiting to happen and it is going to lead to a bad trade for Edgar Renteria or someone like him come July. Maybe the Giants are lying. They are one of the stealthier teams in MLB. Maybe all this “we’re done/we don’t have any money” talk is a front and we’ll have a real option come March. But it sure doesn’t look that way. God help us. This entry was posted in Giants and tagged brandon crawford, Emmanuel Burriss, giants. Bookmark the permalink. I know Crawford is a risk, but I think the risk is minimized. First of all, he is superb defensively, valued at 1-2 wins, depending on the stat you use. So he will deliver value all the time, given all the balls going his way on any given day. His hitting, while it won’t be great, I think he will be OK. If you look at his progression over the season, he was able to avoid the strikeouts all the time, he just wasn’t doing enough to make solid contact consistently. Until, that is, in September, then he carried it into the AFL. If he hits the .240-.250 that Bochy thinks he can, he’ll be OK for us at SS. About Burriss, he also knows how to handle the bat, avoiding strikeouts, but his major problem is the inability to hit for any discernible power. According to Bochy, his numbers have been hampered by injures in recent years. If he can hit like he did in 2008, that would be great, which is sustainable because he strikes out so few times relatively. I don’t think the Giants would go with him as platoon buddy with Crawford if they don’t think 1) that he’s healthy, and 2) that he couldn’t hit well enough. Besides, few players who could possibly start would want to be the backup to Crawford, it is better to do this, take the chance, if we have to, then we trade for a SS mid-season. Plus, who knows, by then Panik might be ready. Good point on Panik. I hope he’s ready fast! I still wouldn’t mind Alex Gonzalez as a back up because of the power issue with Burriss.